Very often we use things made of urethane or polyurethane. But we may not know. And many think that the only difference between the two is that polyurethane is made up of several urethane compounds. But in fact, it is not so. There exist many differences between the two compounds. The first and major difference is the number of urethane organic units in both the compounds. Polyurethane is made up of a chain of urethane organic units joined. These polymers are formed by the polymerization reaction. The raw materials that are used to manufacture polyurethane are polyethers, polyesters, glycols, and di-isocyanates. Urethane has the functional group R1-O-(CO) NR2-R3. These are the carbmic acid esters and are amides. Polyurethane compounds are very stiff and hard.Â So owing to these properties, polyurethanes are used in the manufacturing of foot wears, solid plastic items, foams for bedding and upholstery, and other items like print rollers and gel pads. Urethane is used in many insecticides. It is also used in certain veterinary medicines and human pharmacotherapy. Urethane can be molded into different shapes and types for various purposes. The methods used for the molding are compression, open casting, and one shot systems. There are different types of polyurethanes like linear polyurethanes, castable polyurethanes, millable polyurethanes, thermoplastic polyurethanes, cellular polyurethanes, sprayable polyurethanes, poromeric polyurethanes, and spandex fibers. Polyurethane has been tested and is found that it is not toxic to handle the products in normal conditions. Urethane is acutely toxic to smaller animals like rats and rabbits. The compound does not have any odor but a bitter taste. Some people get nausea after consuming medicines with urethane content in it. If urethane is applied on the skin or administered orally, it is reported to have caused cancer in the smaller animals. Out of the two, polyurethanes are a bit tougher and harder than urethanes. Polyurethanes are used in paints for a better coating and shine. Some of the benefits of urethane over polyurethane are the low tooling costs, resistance to abrasion, durability in forms of plastics, load bearing and compression properties, good coefficient of friction, stability, maintenance of shape and size of the product, and resistance to ozone and oxygen. Polyurethane elastomers have the capability to bond well with metals and plastics. These compounds have a high resistance to the harshness of the environment. It is much stable against the effects of hydrocarbon solvents. Polyurethane also has good resistance to the oxidation levels. 1.Urethane has the functional group R1-O-(CO) NR2-R3 and polyurethane is the chain of the urethane organic groups. 2.Polyurethanes are harder than urethanes and so the uses are many. 3.Polyurethanes are reported to be non-toxic on humans. Urethane may be not suitable for use by many. In smaller animals, it is said to cause cancer when administered orally. 4.Urethanes are used mainly in the preparation of insecticides and certain medicines. 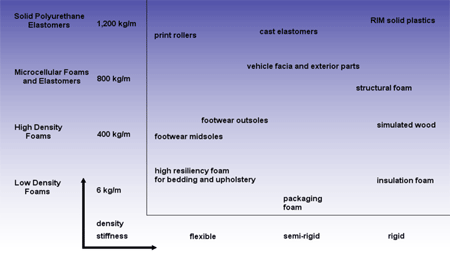 Polyurethanes are used in the manufacture of foams, gel pads, foot wears, solid and hard plastic items. Manisha Kumar. "Difference Between Urethane and Polyurethane." DifferenceBetween.net. November 6, 2018 < http://www.differencebetween.net/object/difference-between-urethane-and-polyurethane/ >. which memory foam mattress topper is safer, polyurethane or urethane? Thanks for sharing your thoughts aboout plastic. Can you apply Spar Urethane over polyurethane?